Thanks, Maureen for having me on Just Romantic Suspense once again. Last month I went back into the past to talk about Fire Angel, my book which celebrated its first birthday in April. Today, I’d like to talk a bit about my second book, In Plain Sight, which was released in August of 2013 and give a sneak peak at my tow summer releases, Echoes of the Pass and a book which as of yet is untitled—hence today’s topic. Finding the title for Fire Angel was the easiest thing I’d ever done. It was the name the antagonist in the book used for himself. 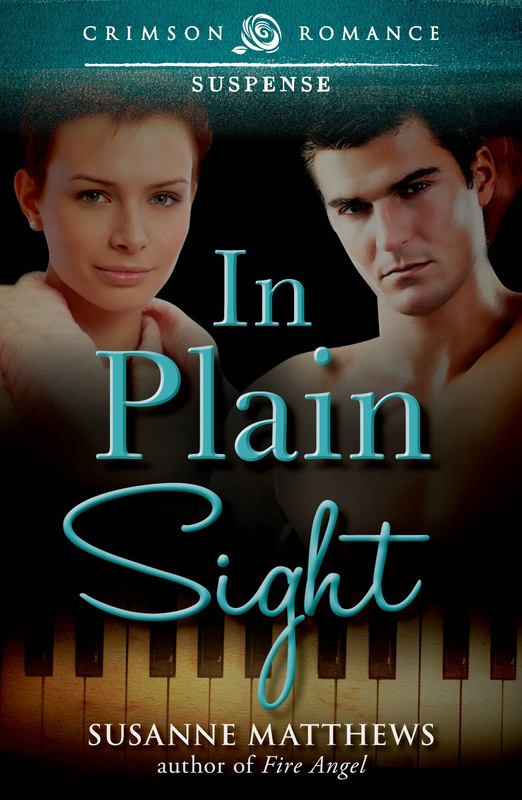 When I wrote In Plain Sight, I chose the title because it was play on the two plots in the novel. My hero, Nick, suffers from conversion disorder—what we used to call a psychosomatic disorder. He blames himself for the death of his wife and unborn child. Nick was a famous concert pianist, but the accident which claimed the life of his wife, left him paralyzed for a time, and blind. The story opens with our hero taking a chance by offering to be the musical director for the local little theater presentation of Jesus Christ Superstar. Throughout the novel, Nick has to learn to see beyond his perceived guilt. He also has to learn to love and trust again. Misty, is the victim of domestic abuse, but more than that, she’s in the Witness Protection Program, hiding from the head of the Irish mob who’s put a price on her head. Where is she hiding? In a small upstate town in New York—out in the open—in plain sight. Now, she has to learn to trust again and to give her safety and security over to someone else, but just how much safety can she find with a blind man? My third novel, Echoes of the Past was easily named as well. Since the novel has paranormal elements, not strong enough to overshadow the present danger, the name just came to me. You’ll learn about that story the next time I visit. The book giving me a headache now is my latest romantic suspense due out August 14, 2014. It had a title, one that came to be like a bolt of lightning out of the blue, but the editor doesn't like it, and as we all know, the publisher/editor, like the customer is always right. I’m struggling to come up with a new title, but the old one, which she says has negative connotations keeps creeping into my mind. How to you forget something that to you seems so right? I’ve thought of other titles, and they don’t seem to capture the book the way the title I’d originally given it did. So, how do I fix it? Well, I’ll begin by leaving it unnamed until I finish the edits. Perhaps when I’ve changed the storyline to suit the editor, a new title will spring out of the ashes like a phoenix reborn. For now, I’ll spend time getting to know my characters again, getting a handle on what makes them tick and how they overcome internal and external struggles. Who knows, I may yet use the defunct title on another book. In life, you pay a price for everything you do. Widowed, her dream of starring on Broadway in ashes at her feet, Misty Starr yearns for a happy, healthy, normal life for herself and her four-year-old daughter, Debbie. Settled in Pine Falls, NY, a sleepy little town filled with friendly people, she believes she’s found it and feels safe enough to sing in an amateur theater revival of Jesus Christ Superstar. She’ll do anything to keep this life even if it is built on lies, because revealing her secret is impossible. When Nick Anthony joins the cast as music director, Misty is attracted to the man who stirs up feelings she thought long dead, but can love grow on a bed of deceit? A former concert pianist and secret CIA courier, Nick lives in darkness ever since the accident that killed his wife. The doctors say there’s nothing wrong with his vision, so why can’t he see? Hiding from his former life, he reluctantly agrees to help with the musical and is drawn to the young singer with the voice of an angel. When a mysterious fire destroys her home, Nick vows to keep her and her daughter safe. After one suspicious event leads to another, Nick is determined to protect them from an unknown assassin, but in order to do that, he needs to know her secrets. With his money and connections, he'll do whatever it takes to save the woman he loves, but does she love him enough to reveal the truth? The stranger was tall, well over six feet, with short, dark hair that curled at the neckline, attesting to the fact that it needed a trim. There was a recently healed, jagged scar along the right side of his forehead that ran from the top of his hairline to his eyebrow, but instead of marring his beauty, the mark made him seem more intriguing and reminded her of a similar scar on a young wizard from a series of books she’d loved in her teens. He was clean-shaven, with a Roman nose, and had a generous mouth with full lips currently turned down in a frown. He wore black, brushed-denim jeans, which molded to his muscular legs like a second skin, a charcoal gray shirt, and a black, kid-leather jacket. His feet were shod in black leather loafers. Everything about him, from the way he held his head to his shoes, screamed, “Look at me! I’m somebody!” Misty shivered. Whoever he was, he didn’t seem at all pleased to be here. Based on his austere clothing and the scowl on his face, Misty decided he must be a serious-minded individual, and from his glare, she’d bet he was no more impressed with her costume than she was. Then again, it might have been her tactless comment that had soured his disposition. For all she knew, if he was the money behind this particular staging of Jesus Christ Superstar, she might have struck a nerve. He might even have chosen the color and the fabric with economy in mind. She knew Martha had bought up all the remnants she could find in town. It was her turn to frown. Fabulous guys like this were either gay or married. Hell, Martha, the wardrobe director, might even be his wife. Hadn’t Amber said Martha’s husband was a trust-fund hottie? Well, this man was most definitely hot, and the clothes he wore so well shrieked money. The unexpected shot to her libido momentarily had her forgetting who and what she was. Reality quickly reasserted itself. Misty had been living in Pine Falls for eight months now, and she really didn’t want to move again. She and her daughter, Debbie, were happy here. This man was a stranger, and strangers spelled danger. For more than four years, she’d run from relationships and people, including confident, powerful men like this one, avoiding friendships and commitment. She’d kept to herself, believing that if she did, she’d be safe. It hadn’t worked, and good people had died. What made her think stepping outside the box to become a member of this community and make friends here would be a wise thing to do? At the moment, it looked as if she might have made a colossal error. Her mind focused on the present and the gorgeous stranger who reminded her of a sleek black cat, whose stormy, gray-blue eyes seemed to look right through her. She shuddered. This man was dangerous. He walked with the grace and ease of a panther on the prowl, wary of everything and everyone in the room. He might look like he could purr under the right circumstances, but at the moment, it was more likely he’d rip your throat out if he got the chance. Micah walked over to the center of the room with the stranger following close behind him. She wanted to look away, but she couldn’t seem to get her eyes to cooperate with her brain. She was like a moth drawn to the flame, unable to escape its destiny. Susanne Matthews was born and raised in Cornwall, Ontario, Canada. She’s always been an avid reader of all types of books, but always with a penchant for happily ever after romances. In her imagination, she travelled to foreign lands, past and present, and soared into the future. Today, gets to spend her time writing, so she can share her adventures with her readers. She loves the ins and outs of romance, and the complex journey it takes to get from the first word to the last period of a novel. As she writes, her characters take on a life of their own, and she shares their fears and agonies on the road to self-discovery and love. Thanks for having me on. I always enjoy my visits here. So interesting to hear how different parts of a book come to be. Thank you for sharing this, Susanne!